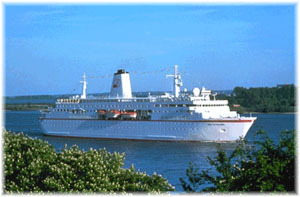 The cruiseship Deutschland was delivered to the German owner Peter Deilmann Rederi, by the German shipyard H.D.W. on 11 May, 1998. This builder had not constructed a cruiseship since 1987, the year of the delivery of the Astor. The ship was built in sections by four shipyards (one of them Finnish), to be finally floated in HDW, which built only the aft section, including the engine room. To honor her name, the major part of the 130 subcontractors were Germans. Only 20 foreign firms collaborated in the building. Deutschland has some very particular characteristics, which make her a singular ship in the cruise market: this ship was dedicated to a national market. Peter Deilman, non interested in the global market like the bigger cruise operators, directs all the efforts to satisfy the German passengers. The design and the decoration of this ship clearly reflected this expectation, even the crew is mainly German and she proudly flies the German flag. As all ships recently built for Germans this is a ship relatively modest sized (22.400 GRT). At a time when ships are competing with each other in size, Peter Deilmann looks back to the golden days of ocean crossing. This ship was directed to the elderly, and this is reflected in the decoration, twenties style, and in the itineraries. The Deutschland carried out her first five months cruise around of the world early this year. The ship is fitted only with two cabins with balcony, unlike her rival in the German luxury market, the new Europe of Hapag-Lloyd, delivered last September. Peter Deilmann (63, the day on which the ship was handed out) began his shipowning career in 1968, dedicated then to cargo ships. In the seventies, he started to cover the passenger line between Holstein (Germany) and Bornholm (Denmark), with little passenger ships, with an annual traffic of some 250,000 people. In 1979, and after selling the cargo ships, Peter Deilmann contracted the construction of his first cruiseship, the Berlin, and bought the old German passenger ship Regina Maris, built in 1966, with a capacity of 300 passengers. The Peter Deilmann ship itineraries were always a novelty, instead of repeating a weekly pattern and calling at the same ports as done by other owners. In 1983, Peter Deilmann extended his activity to the river cruises, and contracted the Danube Princess, his first river cruise ship (currently he owns five). That year the Regina Maris was sold to be converted into the yacht Alexander, for the Greek owner Latsis. 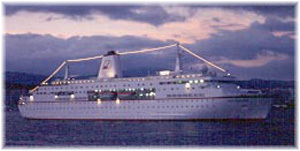 The Berlin was chartered to a Singapore operator in 1982, to make cruises in the Far East. In 1984, she returned to Europe, and in 1986, to increase the capacity, she was lengthened 16.80 meters. In this way the hull could accomodate 61 new cabins, with an additional capacity for 140 passengers. In 1994, with the delivery of the Lili Marleen, the German owner opened another new market, the sailing ship cruises, with innovative itineraries in the Mediterranean, Canary Island and Caribbean. The following year saw the first international expansion of Peter Deilmann, with the opening of the American branch EuropAmerica Cruises. In 1996 he also opened a sales office in London to attend to the British market. These offices are dedicated preferentially to the promotion and sales of river cruises. The number of passengers transported by the middle of ninety's ascended to 30,000 people, and perspectives for the future were very promising. The expansion of the fleet seemed the only possible solution to satisfy this growing market, and at the end of 1995, Peter Deilmann contracted the Deutschland. The designers of the major part of the public spaces was the German Partner Ship Design that had already worked on Lili Marleen, furthermore they had references from Aida. The layout of the other cruiseship owned by the company, the Berlin, follows the prevailing criteria of the early eighties that so influenced the German naval architects. The Deutschland has a different layout. The passengers have seven decks, although almost all formal public spaces are located on decks 6 and 7, while on the deck 9 whe have the pool, the solarium, etc. Passengers embark, through the atrium, in the forward section of the ship, the baggage is handled in the central part of the ship and food, fuel, machine spare parts, etc., are all in the aft part of the vessel. The meeting point on board is an interesting and singular atrium, which extends throughout three decks. The passengers embark in the lower deck of the atrium, which makes the orientation on board easier. There is an impressive classical picture in her aft bulkhead with a skylight. 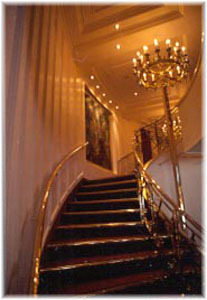 The ship has three staircases and each has an elevator. Movement on board can be inside or outside like in the old passenger ships. The walkways are correctly designed and dimensioned, and you never feel crowded on board. The most singular area on board is "Kaisersaals", an amphitheater that occupies a part of the prow on decks 6 and 7. 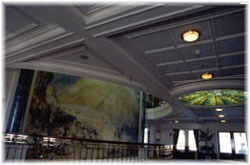 The decoration is like a ball room of the golden twenties, with classical paintings in the roof (like the first class dining rooms of the "Reliance" or of the "Vaterland"), crystal chandeliers, paintings and candelabra in the walls and a great crystal lamp located in the center of the room. At the same time, "Kaisersaals" is fitted with state of the art sound and audiovisual equipment. The red tones and the brilliant brass give a vibrant character to this area, which is anhanced by large lateral windows on the lower deck. Special attention was given to the curved stairway that communicate both levels, in the aft part of the room. The passengers have complete liberty of choice in dining. There are no fixed table or sittings, and passengers can choose between three dining rooms. 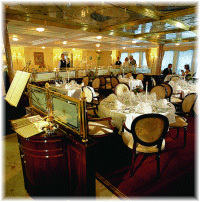 The main restaurant "Berlin", which is located on deck 6, with a capacity of 300 people that has a grand buffet where one can choose between nine dishes. The second is the 'a la carte' restaurant "Vier Jahreszeiten" with 104 seats which has very classic 'art deco' decoration. Here we have the "Chancellor Room" which is available on reservation for private parties up to 12 people. Then, aft of the pool, there is the "Lido Restaurant" with 152 seats. It offers buffet, barbecue and grill for passengers that want to dine while they enjoy the view of the sea. Each restaurant is fitted with an aft separate galley, and all three use the same system to eliminate smoke. All dishes are of porcelain and all knifes, forks and spoons are metallic to maintain the classical ambience on board. The "Lili Marleen" lounge is situated between the restaurant and the theater, aft of the atrium. It is used for aperitifs and after dinner drinks. The ambience is very warm and welcoming, with decorative elements such as a chimney, etc. Other attractions include live music, a piano player, etc. The shopping gallery, decorated in wood, is situated aft of the atrium on deck 7 and is one of the best ambience on board. Last of all there is the cinema, with a capacity of 83 guests. An area less important nowadays in modern cruise ships as the cabins are provided with TV sets. This is is the only public space located on deck 8, and also can be utilized as conference room, lecture room or meeting room, etc. The Deutschland, being a ship for the elderly, has no discotheque and specific areas for kids. The most surprising lack is that of a Casino. The exterior designs of the ship is very classical and it is anhanced by the great funnel of classical shape which is situated almost in the center of the ship, differently to the tendency to position it as aft as possible. Two vertical masts , located both at the ends of the superstructure, are other classical details. The fact that the superstructure is low, and scaled both forward and aft, gives the ship a yacht like appearance, and yet at the same time she appears strong and sturdy. The absence of the balconies, replaced by large windows, help this impression. Deck 9 is divided in three sections. 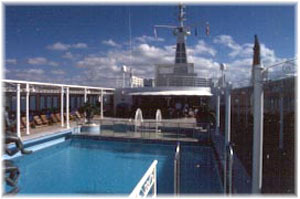 Forward, the "Lido Terrace", that recreates the so called Palm Courts or Winter Gardens, so popular in the classic passengers ships. This little area (90 seats) is decorated in clear tones, and the stores and the wicker furniture give him a very warm atmosphere. The aft bar serves light breakfast for the late risers and afternoon tea and coffee are also available. It is used as a library as well. If this area had been lengthened to the forward extreme of the deck, the designers could have converted it into one of the best observation lounges afloat. It is also utilized as solarium, with classical wooden and cloth hammocks, but with plastic deck. In that zone is located the Serge Mangin's sculpture "Save our Seas". The outdoor pool is situated in the central section, forward of the funnel. Forward the pool there is the semicircular "Pool Bar" complete with umbrellas and classical furniture. It is enriched with teak floor and protected with crystal screens over the gunwale. As in all the German owner ships there exists an indoor pool of Roman atmosphere, situated in the third deck, completed with zones for massage, sauna, etc. All the superstructures of deck 9 are fitted of other classical details: a decorated canopy with yellow bands, that protects passengers from the sun. Bronze sculptures with classical or imperial German motifs are also found in this zone. The jogging track also surrounds this deck. In the aft part of this deck there is the "Lido Restaurant", with an informal buffet, and the "Lido Cafe", that gives service to an exterior zone with steel tables protected by umbrellas, which extend through three decks. In the lowest of them, the seventh deck, we find the "Fritz Pub", of nautical ambiance, that also gives service to these exterior zones. The Deutschland transports 580 passengers in 302 cabins, 224 of them are outside, but only two has balconies. All are equipped with air conditioning, double or twin beds, minibar, safe, hair dryer, telephone, etc. The floors are of moquette, very classic, while the closets have a surplus capacity. Surprisingly all the locks are fitted with a key, another "classical" detail of the ship. d) "Kabinett", of 11.5 square metre, almost all inside cabins with two beds, though there exist some individuals on deck 4. As opposed to the contemporary tendency to use diesel-electric propulsion implants in cruiseships, the Deutschland is motorized with a conventional system, of the diesel mechanical "father&son" type. Following the criteria of utilizing as far as possible 'made in Germany' equipment, the four 12.320 kW main engines were made by MAK, the same maker of the two auxiliary engines. To ensure the manouverability in port, the Deutschland has a 1.000 kW bow thruster, as well as two Becker rudders and two main controllable pitch propellers. She has also fin stabilizers to insure the comfort of the passengers. After some months of operation, the owner was forced to substitute the propulsion gears by other made by Renk. This operation, carried out last May, during the guarantee docking, tried to reduce the noise level, judged unacceptable for a deluxe ship. The new gears cost over one million dollars. On board is installed a state-of-the-art equipment of navigation, waste management and communication system. In the first months, Deutschland navigated in European waters, starting on the Norwegian fjords (between May and August of 1998), for later sailing in the Mediterranean. The first round the world cruise began on 11 November, 1998, in Santa Cruz de Tenerife, and was prolonged until 24 April, 1999, when it ended in Lisbon. This 163-day cruise is commercialized in 12 different segments. In her second summer season, she cruised in Scandinavian and Mediterranean waters, prior to her second round the world cruise. I could affirm that we are facing one of the more characteristical cruiseship among those delivered in the last years. She sails as the floating grand hotel of the seas, with the heydays of personal service. Furthermore, Peter Deilmann could conjugate the magnificent installations of the ship with her imaginative destinations. The future of the Deutschland can be only splendid.